We are beyond excited for another year of muddy, rich play-based learning experiences at Tiny Trees Preschool. As the new Director of Education, I want to welcome all of you into our family. Our last two years have been an amazing opportunity for our organization to test and define what is truly possible for outdoor preschool. As we continue to thrive and learn in our “Pioneering Years,” we appreciate the leap of faith that our teachers, families, and partners take in joining us and are grateful for so many people who also believe in the power of the outdoors for young children. Teachers moving from Colorado, Ohio, California, & more! Two Lead Teachers promoted to Program Supervisors/Professional Development Coaches. Teachers who have taught at well-known outdoor preschools elsewhere. Teachers who are highly experienced pre-school teachers. A new cohort of Americorps Teaching Residents. Administrators who bring their administrative, technical, and people skills to the table for the purpose of furthering the organization’s mission. Our teachers are supported and supervised by a Program Supervisor to their park, who you will see regularly in our classrooms, as well as a team of administrators, volunteers, and the broader community who, like us, believes that children deserve a childhood that honors them. During the school year, we close 1 day per month to offer our teachers a Professional Development Day, which is part staff meeting and part training. We will bring in speakers, offer training on HighScope and other curriculum trainings, nature education, race & equity, de-escalation, and more topics. We reserve a part of this day to discuss risk management and safety so this practice is always fresh. More information about our curriculum can be found in our Family Handbook. Tiny Trees Preschool is an inclusive program, which means that all children will be at different developmental levels, come from a variety of backgrounds, and we will support and celebrate all students in ways that best meet their needs. We are also a non-expulsion school. We know that children learn best when they are in school consistently and have opportunities to develop trusting relationships with their teachers and classmates. We use anti-bias practices to engage children in critical thinking skills around tolerance, acceptance, and equity, and we work to ensure that our community also practices those skills. For more information about our approaches to learning, behavior, and curriculum, please see our Family Handbook. Who Do I Contact About My Child’s Education? Your child’s teachers are the experts on your daily experiences. Partnering with them is key to your child’s success in school, and they are all so excited about working with your families. Additionally, our families may benefit from connecting with our administrative team. A full list of contacts is available in the Family Handbook. For admissions questions, family support, registration and orientation details, or simply to chat, please contact our Family Services Manager, Meri Joswiak at meri@tinytrees.org. For questions about staff, educational philosophy, overall programming, or just to connect, please contact me, Rachel Franz, Director of Education at rachel@tinytrees.org. It is my goal as Director of Education to continue to honor and celebrate the community that surrounds Tiny Trees Preschool. In collaboration with our restructured administrative team, I hope to be able to cultivate an organizational culture that puts teachers, children, and families first in all of our decisions and practices. 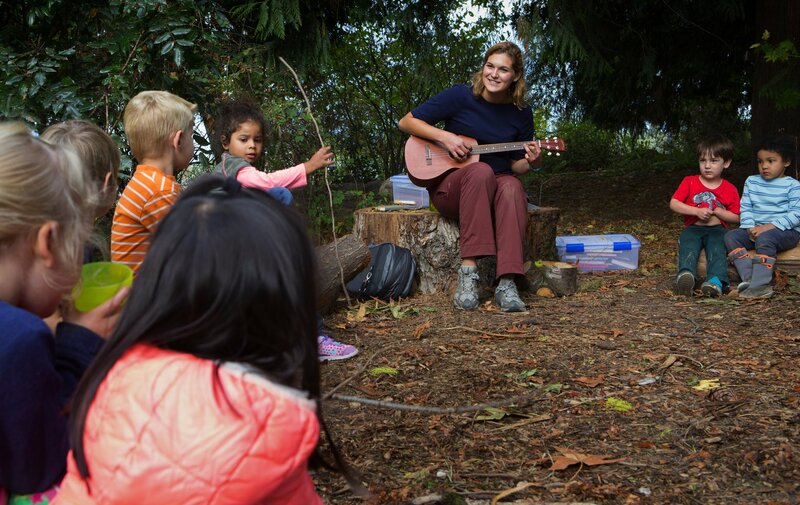 I hope to support the implementation of not only high quality early childhood education outdoors, but also curriculum that offers children authentic, meaningful opportunities and invites teachers to hone their own individual professional journeys. I hope to put equity at the forefront of our practices, making Tiny Trees a model school for anti-bias curriculum to help break down the paradigm surrounding access to nature. I hope to connect us all in increasingly positive, productive ways- to unite families, teachers and administrators in working for the children in our programs. These “tiny trees” deserve all of our love, attention, support, and a lot of puddle jumping.